Morning Glory Designs: Working on an Idea for Teaching EQ7 online -- And a Give Away! Working on an Idea for Teaching EQ7 online -- And a Give Away! I have had a number of suggestions from readers and students who would like more instruction on EQ7. I think this is a great idea, and am working on a way to do this in a live, interactive format. In the mean time I am going to start working on a tutorial for my website. I thought I would cover some of the basics and then take "requests" for tutorials which address specific skills. I am starting up and EQ7 Club at my LQS which meets monthly to work on a new skill or project each month. What would you think about me sharing that lesson here on my blog as well? I am so loving EQ7 and all the new tools that are available in it, that I want to share that with all my readers as well as the great folks who have purchased the program from me. Should I put them up for free or charge for the lesson? Hmmmm, I could sure use some input. Hey I have an idea!!!!! Leave a comment letting me know what it is about EQ7 you would like to learn and how you think I ought to set up lessons. 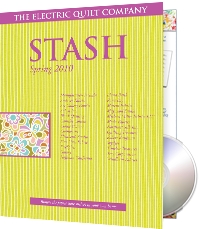 I will select a comment at random and give away a free STASH program to some lucky EQ owner who takes the time to offer suggestions or ideas. 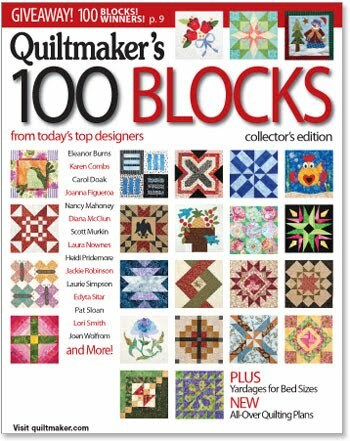 Quiltmakers 100 Blocks Vol. 2!!! I can't wait to see which ones they chose of all the hundreds of blocks submitted. I sent in two blocks and don't know which one they picked. So it will be a suprise for me as well! In addition to the magazine give-away there will be other prizes including Free Patterns and Free FQ bundles. What could be better than that??? More details to come. Oh, and one more piece of good news! I just got my first quilt pattern published in a magazine. 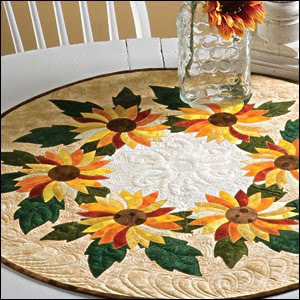 It is called Spinning Sunflowers and the pattern is published in the current issue. I am pretty much beside myself seeing my first magazine pattern in print. Go out and buy the current issue and tell everyone you know. Better yet, make the quilt!! The first person to send me a picture of your completed project will receive a Morning Glory Designs Pattern of your choice! Holy smokes, I am giving so much stuff away this time that I can't stand it. I better sit down! Thanks for sharing my joy with me today while I do my little happy dance. Congratulations on your first magazine pattern! Coincidentally, that very pattern was the first to get the little page marker...I just love sunflower patterns! Congrats on the article I love your quilt. Congratutlations on the pattern being published. That is really neat. I have made a note of the month and will watch my news stand for the magazine. Oh, I have so much I want to learn about EQ7 (or EQ in general)! At the moment, I'm especially curious to know more about bringing fabrics into my library (I bet Stash would help with that!) and how other products can make EQ7 more powerful. I've heard about Blockbase. I've heard about the Farmer's Wife Sampler CD. Is there one for Sylvia's Bridal Sampler? I started to draw some of my own blocks, but gave up. My biggest problem in answering your question is that I don't know EQ7 well enough to understand what I'd like to be able to do. I love the idea of posting the lesson/info from your LQS EQ club. You might as well make the most of the work you've already done! I love the idea of mini tutorials on your blog. I'm on dial-up, so not sure if a live chat would work for me. I know the basics of EQ, but get stuck when I try to draw more complicated blocks. I could use pointers on drawing board set-up and what tools work best in certain situations. The problem with live lessons is we have to be available at a certain time and that doesn't work for many. I'm in New Zealand (other side of the globe)so lesson would be in the middle of the night. I think lessons on blog would be good. we can always leave a question in comments. I'm so happy to see that you are planning these EQ 7 lessons. I'm so looking forward to them. Blog lessons would probably be best, as it would be available to everyone. I would love EQ7 lessons anywhere! I'm surprised there are no books out and I don't think there are any QU classes either. I read you blog everyday so I'd like blog lessons. 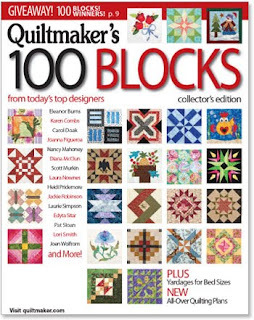 I'll have to pick up a copy of Quilters World, the pattern is beautiful. Congratulations on your publications! I'm interested in learning how to use photos in EQ7. I look forward to your lessons. So excited for you Reeze! This is so nice for fall! I agree with some of the other posts that a blog tutorial would work better for most rather that a live lesson. I'm also glad to find out that I'm not the only one who own EQ and doesn't really know how to use it! I can muddle my way through to some basic designing but just haven't had the time to sit down and teach myself all of the ins and outs of the program. I am looking forward to what ever you are able to show us--it may be the motivation I need to get going on EQ7. Congrats on your beautiful design being published! Also put me down for blog lessons. A screen capture type of thing would be helpful. I have seen several tutorial videos about the computer done this way. Or perhaps I could try to drag my tired self and computer to the LQS every once in a while, but times for me are hard. Know I would want to be there if it wasn't for that pesky sleep thing. Reese, your spinning sunflowers is absolutely gorgeous! That's not one of the magazines I normally get, but I might just have to get that edition for the pattern. What I am having trouble is finding what I would like to know about converting my drawings via tracing in ONE place with EQ7 (recently purchased) to applique patterns.